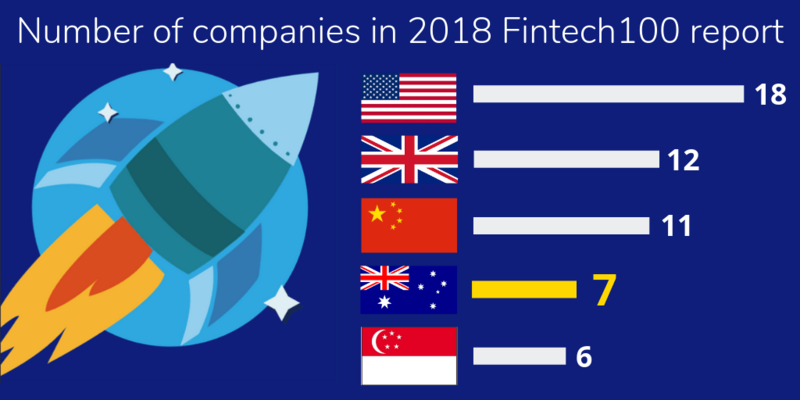 Australia has seven fintech companies, five of which are members of FinTech Australia, in the 2018 edition of the Fintech100 report published by KPMG announced on Tuesday, 23 October, 2018. This year, Australia is ranked fourth on the list trailing behind the United States, United Kingdom and China. A collaboration between fintech investment firm H2 Ventures and KPMG Fintech, the 2018 Fintech100 is the fifth edition of the annual report. The top hundred is further divided into Leading 50, featuring established companies based on innovation, capital raising, size and reach, and Emerging 50, featuring newer companies which are at the forefront of innovative technologies and practices and are often pursuing new business models. FinTech Australia – the nation’s association for Australia’s fintech industry – today congratulated the fintechs mentioned in the report. Afterpay and Airwallex made the Leading 50 list and Agridigital, Look Who’s Charging, Nod, Power Ledger, and Trade Ledger made the Emerging 50 list. With global competition continuing to expand, Australia faces stiff competition from the five leading countries – United States, United Kingdom, China and Singapore. This year 36 different countries represented in the full Fintech100, up from 29 last year. FinTech Australia Chair Alan Tsen said the report is testament to the growing scale and diversity of the global market and Australia is well positioned to capitalise on this growth.